I've been able to try and review a few products from the brand Ozeri on my beauty and lifestyle blog and I have another product of theirs to review - the *Ozeri Pro II Digital Kitchen Scales (£24.68 from Amazon UK). I'm always baking and we do have a digital scale already but it isn't great so I'm glad I have this one now! Although within a couple of days of having it, it ended up being covered in flour - I'm quite a messy and ambitious baker. The scale has a built in kitchen timer and alarm as well as an LED screen and removable glass plate which is easy to clean. It weighs up to 12lbs and it comes with two AAA batteries however the batteries with my scale didn't work so I had to use my own. The manual is easy to follow and there is also a booklet that has a massive calorie guide which will come in handy. I personally love the way the scales look, I think they look more expensive than they actually are and they are fairly small and compact which makes it easier to store. The scales are so easy to use, they seem to be accurate and I will definitely get so much use out of them as I do love baking especially now that The Great British Bake Off is on TV again! 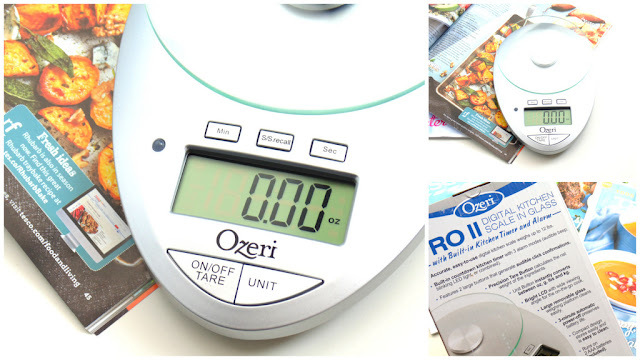 Have you tried these scales or anything from the brand Ozeri? Is anyone else happy that the GBBO is on TV again?